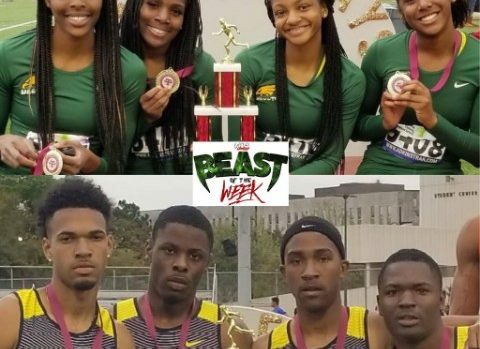 This week’s K104 “Beast Of the Week” golden spikes go to the DeSoto Eagles Track Team for running the FASTEST 4×400 times in the nation at the TSU Relays! DeSoto Lady Eagles Track – The quartet of Cierra Wash, Rosaline Effiong, Zariah Jones, and Bryannia Murphy ran a scorching time of 3:43.66…THE BEST IN THE NATION! DeSoto Eagles Track – Chris Ford, Kennedy Harrison, Kevin Modesto, and Isaac Hastings continued the greatness of DeSoto U. with a mark of 3:12.34…THE BEST IN THE NATION!! Tune in every Monday to Cat Daddy and the Nite Life with Ron Murray to find out who has been named “K104 Beast Of The Week”!